In my earlier post I explained why a mobile device was better providing a web app integration environment rather than a 'native' application. 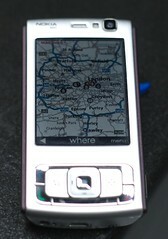 But, because I'm a geek, I currently use the N95 (and it has 'uses'). Overall, the device is very nice. It is Nokia's best phone yet - great feel, (except there is a little play in the slider face), small, great feature set: WiFi, GPS, MicroSD, 5-megapixel camera with good optics and a flash. The first thing that attracted me to the N95 was the good camera. I really wanted to be able to take decent shots while out and about in my life without having to carry a camera. The N95 is the perfect fit. I can take a shot, know it will look good enough for a candid photo, and have it uploaded to my online photo store immediately. Having it geotagged is a huge added flavor favor. So getting to the GPS, besides the camera, this was the only other feature that was really a 'must have' for me - because of my fascination with location. Here is a list of the GPS-enabled applications that I use on a regular basis. There are some others, but I installed them just to play with them, and these are ones I use nearly daily. incredibly full featured mapping application, tracker, and local search. Recently got a cease-and-decist for using Google Maps Tiles (gee, wonder why), but fortunately I pointed out OpenStreetMap to the developer several months ago and within days he added it as an option (free maps on your phone!) Also handles displaying KML files and rumor has it, OpenSearch-Geo in the near future. Plazes (or FireEagle, or some other generic HereIAmWhereAreMyFriends) mobile application - didn't they use to have one? And here's another major hiccup - The N95 has unlimited storage via memory cards - I am a technogeek, yet I still can't get music or media onto my device. Yeah, there is a Nokia Media Manager for Mac - and my phone shows up in iTunes - but I can't actually add anything to the device. I try to drag-n-drop and it just snaps back. Not there, no message, no music - unhappy user. This is something so simple, and so fundamental to Nokia's primary feature set I'm amazed that it's so horribly implemented. So while I don't need to carry another camera with me, and rarely carry my N800 anymore, I still carry my iPod for quick trips. 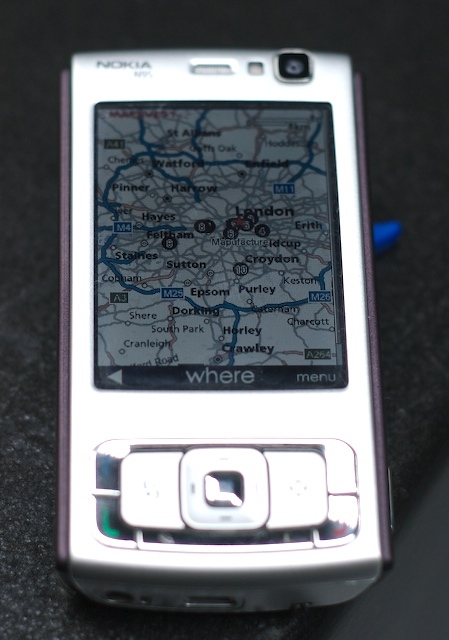 As great as the N95 is, for as long as Symbian has been around there should be a lot more great applications out there. Instead, developing a J2ME or C++ application for the N95 (which may not work on the N80, or N6600, or N800, which means redeveloping for every platform) is extremely difficult and time-consuming. And that's not even addressing the overhead required by a user to find and then choose to install your application - easily a 5-step process, that may even fail and leave unknown bits around you mobile that you later have to reflash to clean up. Instead, Nokia should really team up with Opera to re-release and finalize the Opera Platform, a kind of iPhone WebKit competitor that allows developers to quickly build rich web-applications with hooks into the phone unit itself. I don't want to have to worry about file systems, buttons, synchronization, et al. I just want to develop my app, send someone a link - or even better - build something like AppMarks, Leaflets, MockDock, or Gridgets (to name just a few that showed up within weeks of the iPhone release).